A baby girl's pink and green nursery is a favorite because it's so cheerful, so bright and cheerful, in fact, that often the color scheme is used for years! On this page you will find pictures filled with pink and green baby nursery ideas that will share tips from real moms so you can go about the business of decorating your baby's room using these bright and cheerful colors in an organized manner. This bright and sunny color combination often associated with a day in spring is an excellent foundation for decor that is uplifting as well as functional. Traditional floral patterns featuring roses and tulips as well as fabrics with themed prints like Hello Kitty await your decorating decision; let's go! As you will see from the photos, there's something about pink and green that brings all the beauty of a spring garden to mind, but that's not to say that flowery baby nursery themes are necessary to achieve a successful design. To the contrary, there are many, many themes that lend themselves to pink and green nursery decor. For example, I can remember decorating a vintage nursery in shades of salmon pink and sage green with antique white (that looked amazing with iron crib) and a hot pink and lime green nursery in the same month! Another popular decorating trend is to combine varying shades of pink and within the same space. A bird theme room presents an opportunity to be creative with free printable artwork. 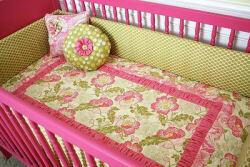 See more baby girl pink and green country cottage nursery pictures here. A shabby chic pink and green nursery or country cottage theme would be an excellent choice should you have some slightly worse for wear cheap wooden baby furniture that could be refinished and used in the baby’s room. 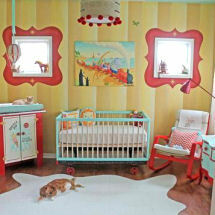 This is your chance to save some money and still have the nursery of your dreams. Study pictures of shabby chic nurseries in any picture gallery and you will see that your chosen colors are widely used with great success. If your furniture is not quite "shabby" enough to be chic or country, simply sandpaper the finish in areas to create a look of wear after spraying that old chest of drawers with a few coats of white paint. If the drawer pulls don't suit your theme, Buy either spray paint the old wooden pulls pink or green or buy new ones to paint to match your baby girl's pink and green nursery decor. Painted pink and green stripes on the nursery wall is a popular way to add height to a room with low ceilings and save money on expensive wallpaper. If you don't have time (or the talent) for DIY wall painting techniques, create a focal point or a wall mural using reusable nursery wall decals or stickers. Take your pick of funky pink and green flower wall decals, polka dots or letters that spell your baby's name. 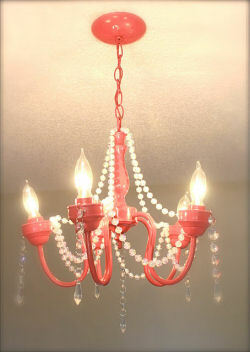 This recycled brass chandelier was spray painted watermelon or hot pink for a baby girl nursery. See more pictures of this room HERE! So many DIY decorators have trouble finding safe ways to bring decorations that add pops of color. What could be more "out of reach" than a hot pink mini chandelier or more useful than a floor or table lamp? 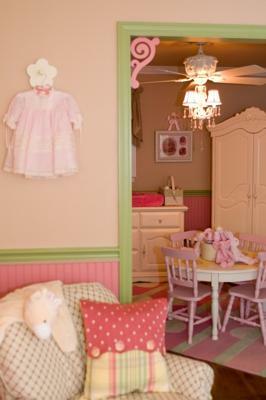 Why does a pink and green nursery work so well for so many different themes and styles? To answer this question, I can only direct you to the color wheel. Shades of green balance warm shades like pink and rose red and the combination is naturally very pleasing to the eye. To create a baby girl's nursery with a formal atmosphere nothing could be more stunning than a pink and green damask crib bedding set. Choose a subtle damask print for vintage or traditional style of decor or a pattern with bright colors for a modern nursery design. Please take a minute to use the form on this page to share your own nursery pictures and pink and green baby nursery ideas! 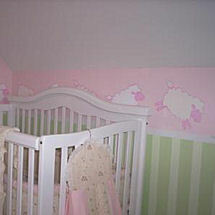 Do you have a great set of baby bedding or a picture of a nursery that you decorated in a pink and green color scheme? Share it!